We had one dinner slot available on our short weekend in Shanghai and I left that decision up to JL, my friend who lives in Shanghai, and who also loves to eat almost as much as I do. After being given a choice of Italian, Japanese and homestyle Shanghainese restaurants we went with local cuisine. And I’m glad that we did, because after spending the day eating at Taiwanese restaurant outlets, it would have been quite sad if I went to Shanghai and didn’t eat any homestyle Shanghainese food! The restaurant is tucked into a little lane off the main road, but we had no problem finding it and the taxi driver knew the street well. It’s separated into two main dining areas, the kitchen is visible through the constantly swinging door located right next to the entrance. As soon as we walked in we were greeted by a waitress balancing 4 portions of a dish of bright green vegetables, obviously one of their signature dishes, and the first thing I did when I looked at the menu was find this dish. 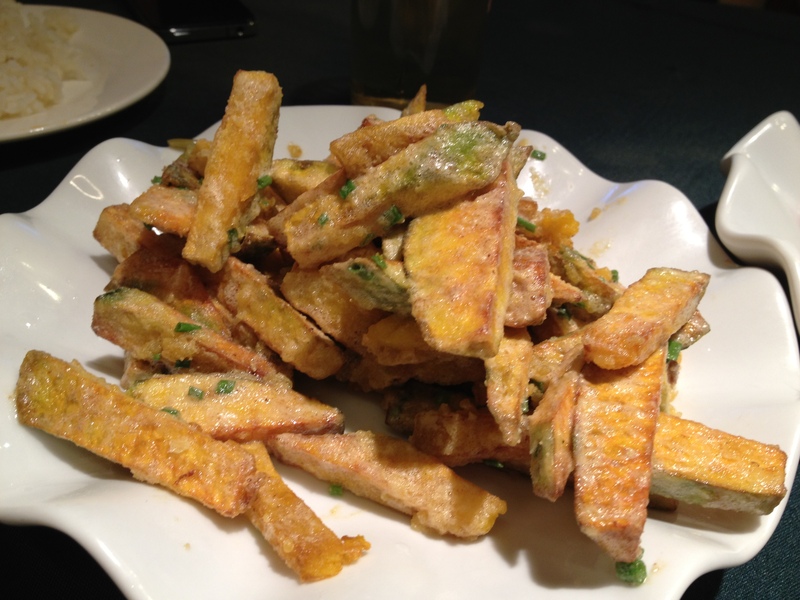 Pumpkin Chips with salted egg （咸蛋黄南瓜条）¥22 – this dish was one of the stars of the evening! Sweet potatoes were sliced and fried with salted egg yolk for a truly tasty veggie dish. 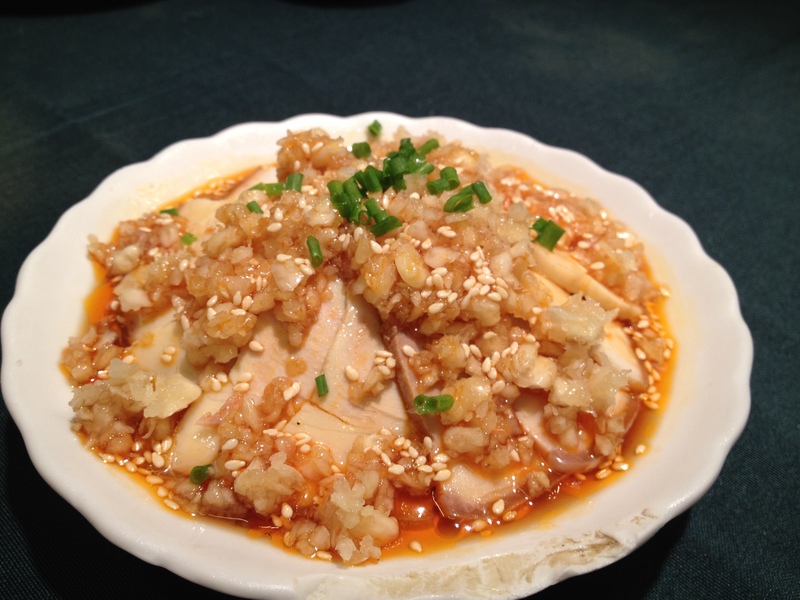 Plain-boiled pork with mashed garlic ¥22 – flavoured with tongue-numbing Sichuan spices and literally smothered with raw garlic, even if the paper-thin slices of pork had a taste, I wouldn’t have recognised it. There was a cooling layer of sliced cucumber underneath, but this certainly wasn’t one of the favorites of the evening. Godly vegetarian duck (功德林素鸭）¥18 – apparently this dish is a favorite vegetarian dish for monks, perhaps that’s why it is thus named…? 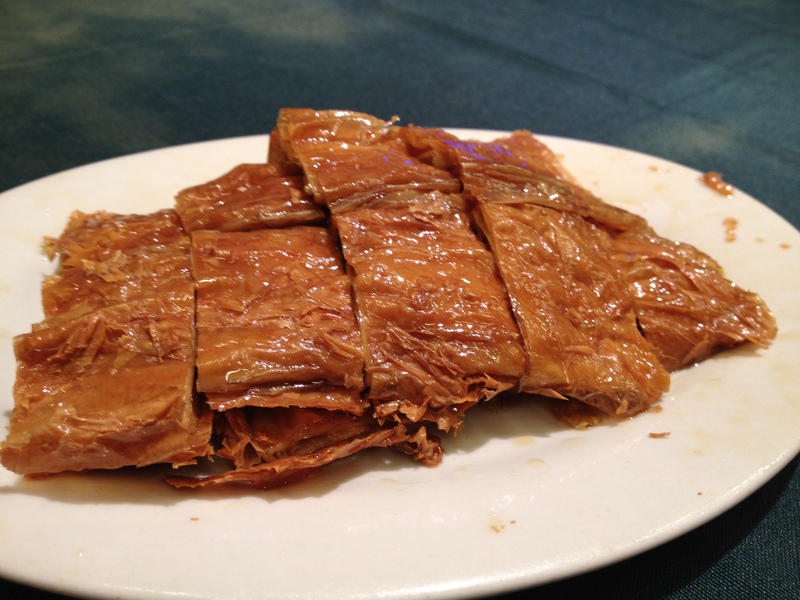 One thing it definitely is is yummy – layers of beancurd skin stuffed with fragrant mushrooms, it was gone in seconds. 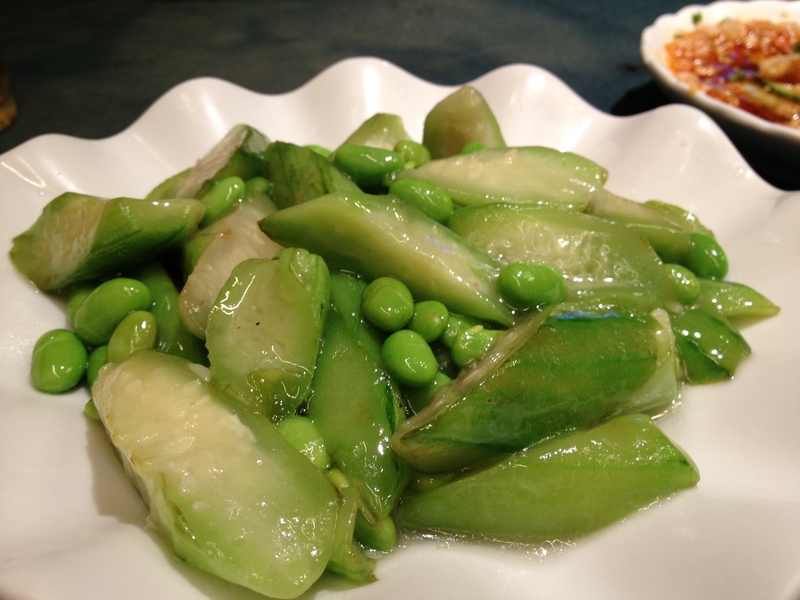 Fried green soybean with towel gourd （丝瓜炒毛豆）¥28 – my must-have menu choice. I love the texture and mouth-feel of gourd. Served with crunchy al dente soybeans, it was one of my favorites. 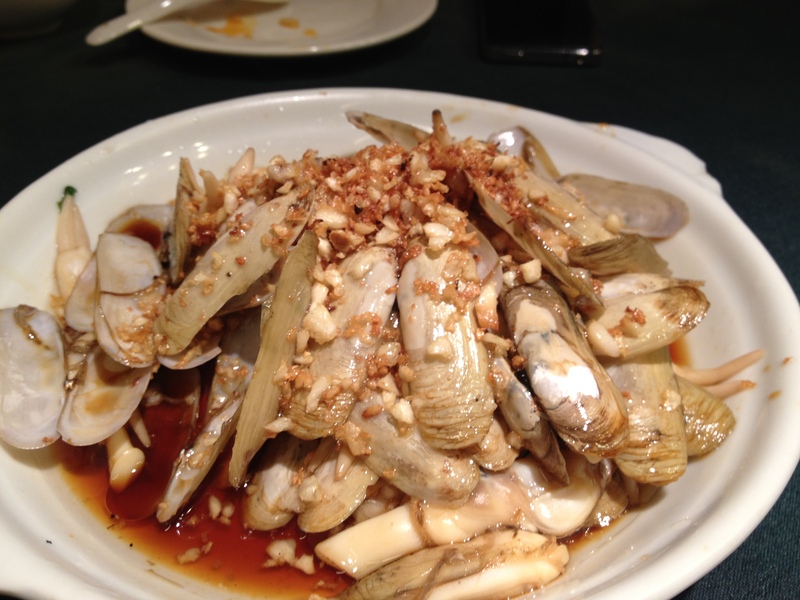 Razor clams fried with garlic (market price) – nothing that we haven’t had before. 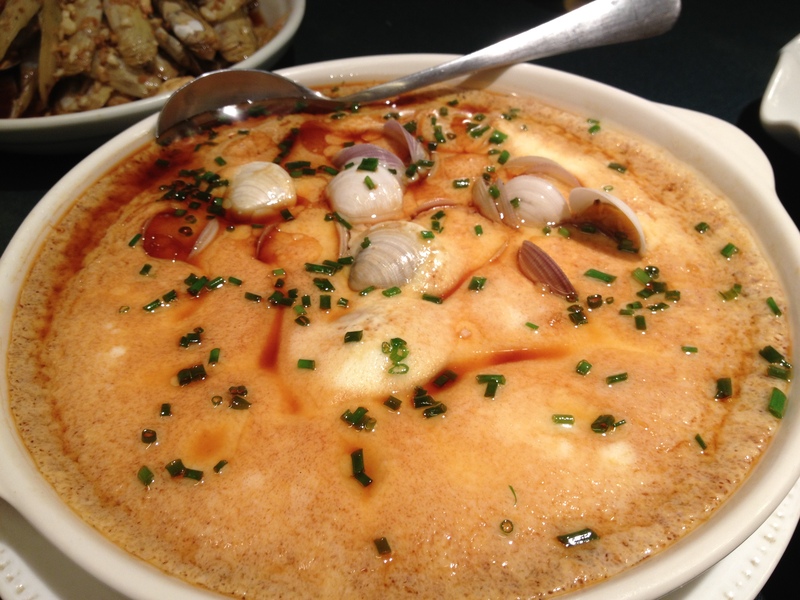 While the shellfish+crispy fried garlic combination is always a favorite, the clams were small and there was still sand in the shells, indicating that they weren’t properly washed. 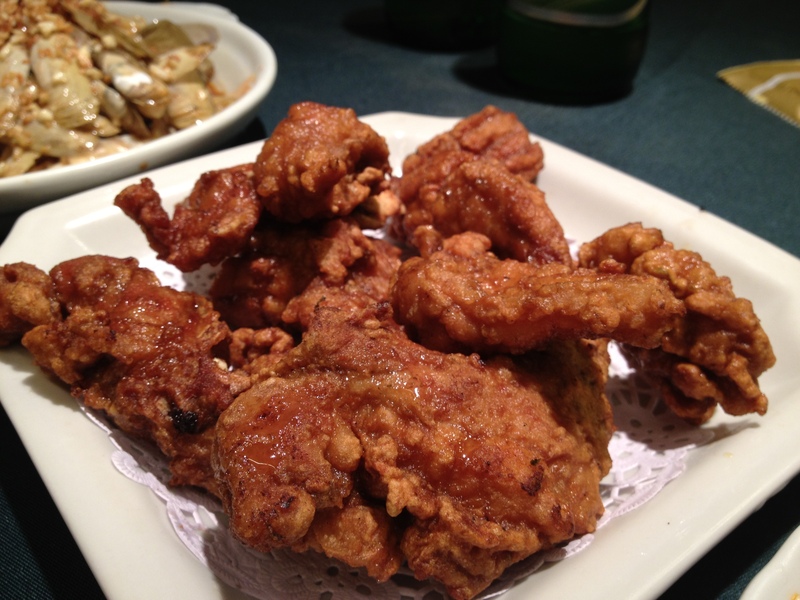 Dry-fried shrimp (market price) – a very nice dish to get your hands dirty with! 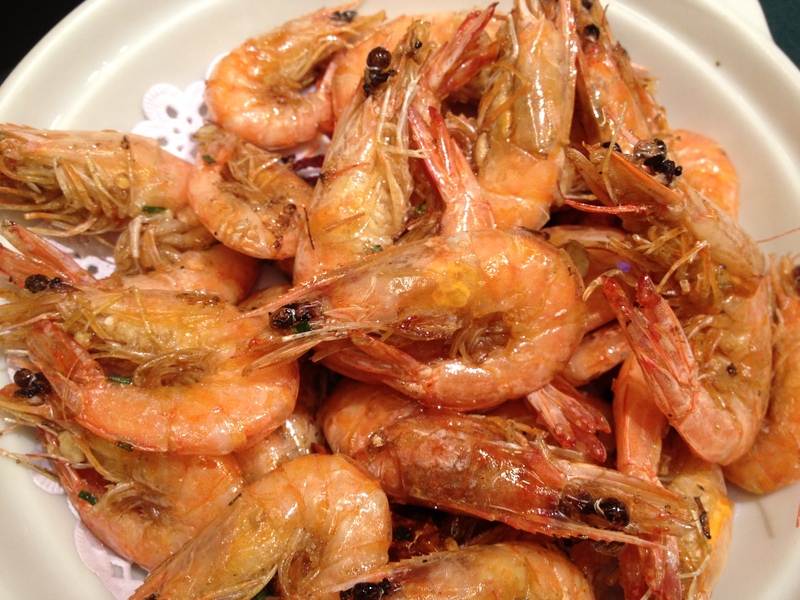 The shirmp meat was sweet and fresh, and even though the dish was a little oily, it tasted as if the oil was flavoured, and that sat well with me. Stir-fried vegetables – I’m sorry that I have no idea where this came from on the menu and what vegetable it is. All I know what I assumed to be red vinegar on the bottom of the plate was actually the natural colouring of the vegetables. 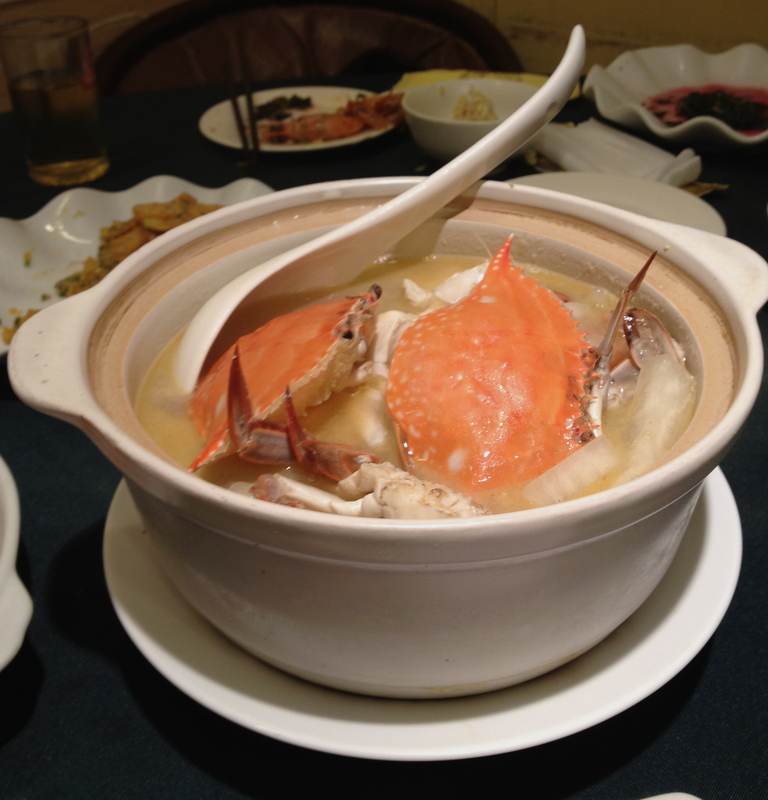 Crab Soup – again, no idea where it came from on the menu, but if you want it, save this picture and show it to them. As a matter of fact, a lot of the ordering at the beginning of the meal was done … by iphone! My friend KS whipped her phone out because she was extremely well prepared and had pictures saved of recommended dishes! She is a fellow food blogger, which explains it all. This meal in particular brings back fond memories of when I lived in Beijing as a student, and each inexpensive meal, not dissimilar to this one, was convivially shared between 6-12 people. It was tasty food, and there was always lots of it, washed down with a few bottles of Yan Jing 燕京 beer. It was also a time when I weighed almost 10 kilos more than I do now – although I wasn’t that bothered by it back then! Let’s not kid ourselves that these dishes are healthy, despite the number of vegetable and seafood dishes we ordered. It’s oily, fatty, comforting, amazingly good food – and we loved it. But eat it every day and you’ll be like me in my Beijing years! Back to the restaurant in focus, the bill came to ¥150 each, a grand total of ¥750. For tasty, casual, comforting food, friendly staff (the owner came to our table at the end of the meal for a conversation and a cigarette! ), I’d definitely re-recommend it. It may not be your first choice for dinner on a short trip to Shanghai, but for a catch up with friends over good food, this is exactly what we were looking for. It also prepared our stomachs for the late night ahead…! This cozy, welcoming bar seems to be big on the expat scene, and serves some really authentic prohibition-era cocktails, and a huge selection of bourbons, aperitifs, digestifs and spirits. The menu was so detailed and so diverse that it came with a (very informative) Cocktail Dictionary! 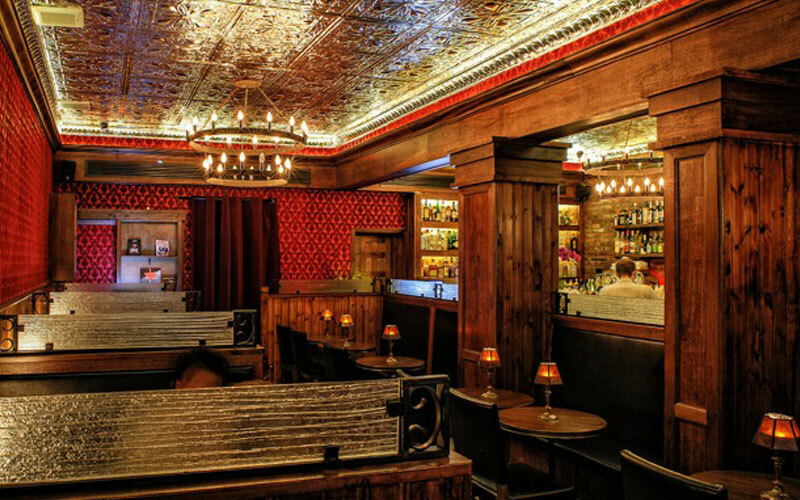 The space is creatively decorated with tin ceiling tiles (LOVE), wood-panelled walls and velvet wallpaper. It’s warm and inviting and before we knew it, we were on round two. Drinks are around ¥55-70 a pop. The staff are a little confused – I ordered a Saint Germain, ‘a sweet liquor crafted in the original French style from elderberry flowers, with a heady lychee aroma’. It sounded like me, but in drink form. But I received a bourbon on the rocks. Then I received something with cranberry and a twist of orange. Third time around, I finally received my drink – I was more amused that annoyed (in my head I’m thinking “hmmm, I wonder what I’m going to get next? !”), and felt bad for the wasted bourbon!! 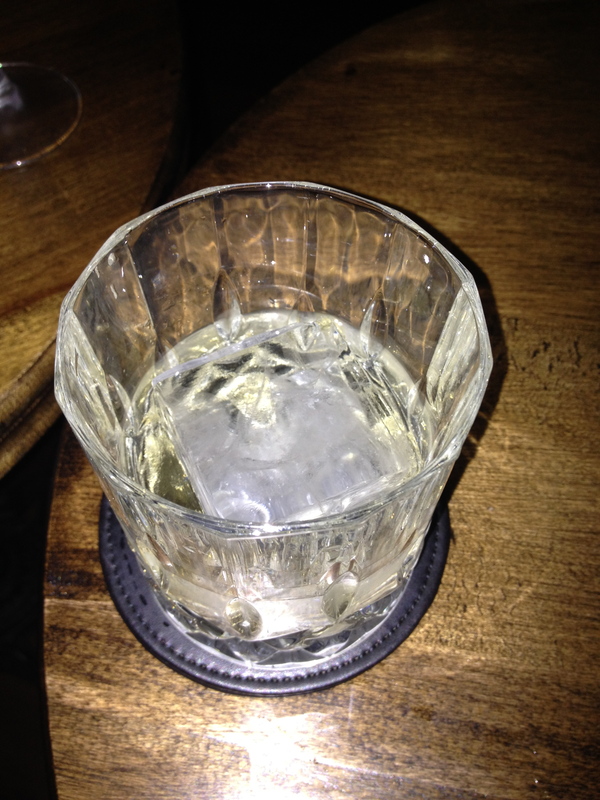 Saint Germain, on the rocks (or should I say, rock) – the ice seems to be hand-cut. Our next stop was El Coctel, a cocktail bar and lounge opened by Willy Trullas, chef and owner of El Willy in Shanghai, and our very own Fofo by El Willi in Hong Kong. It was a cozy place playing cozy music, and we had two more cocktails here. 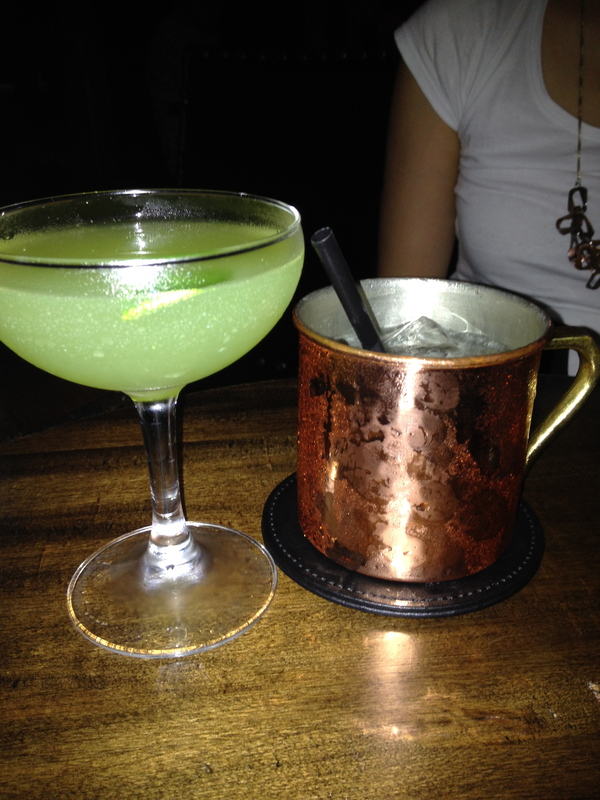 I can’t remember exactly what I ordered, but we had a good time and then left in search of more lively music. Our intention was to bar hop, and that is exactly what we were doing! 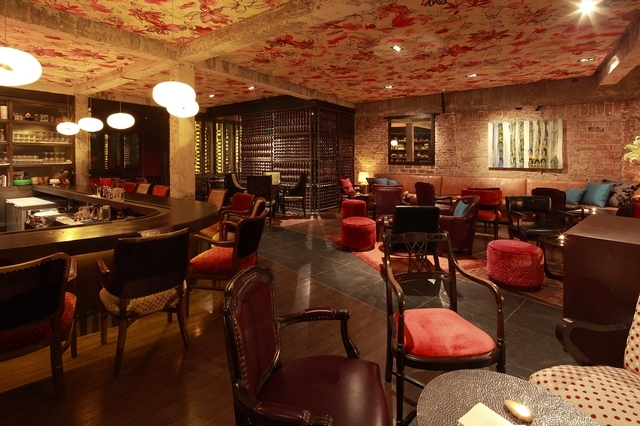 Our next and final stop was Bar Rouge, a relative old-y on the Shanghai clubbing scene. It was recently renovated by Brazilian firm Naco Architectures, and the moment I stepped in, I knew we were going to have a good time. We grabbed our drinks at the bar and head straight out to the terrace, where the air was surprisingly cool and the view was spectacular. 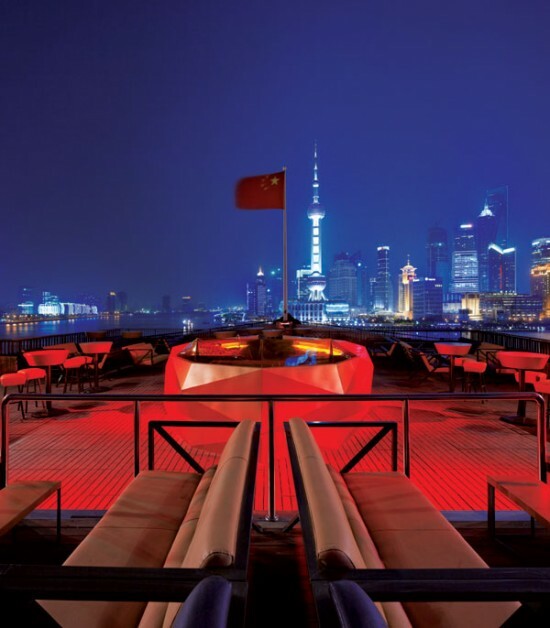 There is no describing that view when you see if from one of the bars or restaurants along the Bund. It’s not the same feeling as seeing it from street level. Here, you feel like you could reach out and prick your finger on the spike of the Oriental Pearl Tower. We drank, we danced, we acted silly, we took photos, and there was a lot of hugging involved. At around 3am, there was an explosion, confetti danced in the air and smoke machines started working over time, quite a sight! All I know is that this was just the tip of the iceberg – apparently Shanghai-ers take clubbing very seriously, several levels higher than Hong Kongers, which seems unimaginable but we caught a glimpse of it that night. There are so many venues to choose from, and apparently they are all always bustling, 7 days a week. We finally left to go home at around 4:00am, not because we were tired, but because we wanted to get up and do things the next day. Check out my next post – Shanghai Part 3! 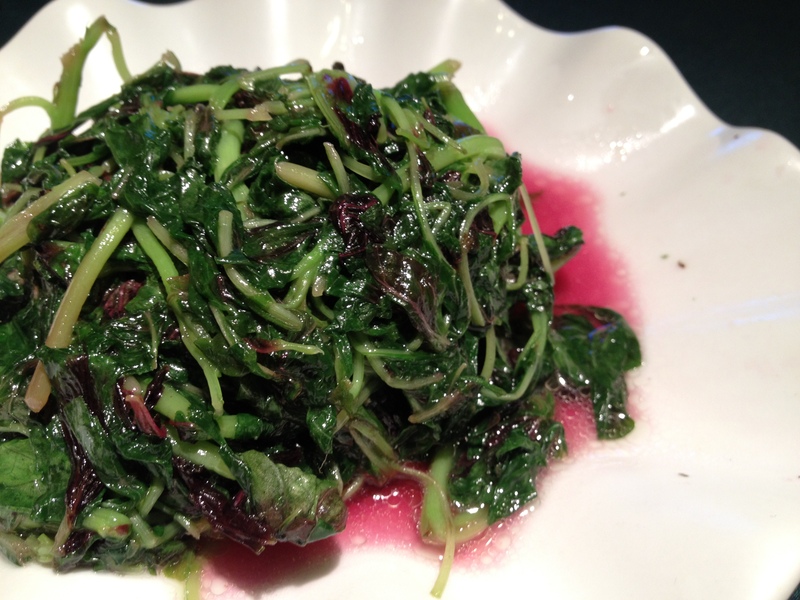 The purple juice vegetable is actually just a special type of Chinese spinach…you will find that in most stores in HK. The stalks will have a purplish color. The texture of the vegetable is just like regular spinach. Sounds like a yummy trip! Where are the drunk photos? Another great post! And you got me feigning for some fatty spareribs! Thanks darlin – I await the day where we can do a trip to SH together with Jo and paint the town red (or maybe a muted red, pink maybe 😉 ) like the good ol’ days!